Abby Kish had the lone goal as the Bantam B Crunch skated to a 1-1 tie with the North Durham Blades in their first of two games this weekend. Natalie Mills and Claire Whitney picked up assists. They followed that up with a 3-0 win over the Northumberland Wild. Savannah Mumby earned the shutout while Kish, Whitney and Huntyr Haines each had a goal. Ainsley Hickerson and Kish earned assists. Mumby was particularly busy in the third as the Crunch kept up their province wide lead in penalty minutes. The Crunch are also now sitting atop the East standings in points and goals for. -The Napanee Peewee BBs kept their strangle hold on first place in the division after winning both their games on the weekend. They beat the Whitby Wolves on Saturday, 4-1. Diana Wharton was solid in goal for the win. Napanee opened the scoring midway through the first period on a shot by Taryn Landine, assisted by Claire McConnell. Ava de Almeida riffled a shot from the point with 18 seconds left in the first to make it 2-0 with assists to Kaya Richardson and Hailey Lay. Kristen Sutton scored unassisted in the second period as did Claire McConnell from Landine. Wharton faced a barrage of shots early in the third period and held off the Whitby shooters. Napanee then beat the Peterborough Ice Kats on Sunday, 2-0. Keyra Herrington earned another shutout.The game was scoreless through two periods in a tight checking game. Landine broke through on a breakaway after a pass from McConnell and scored with a laser beam shot over the glove of the Ice Kats’ goalie. Sutton added an empty netter to seal the deal. -Napanee’s Bantam A Crunch team played in the Kitchener Lady Rangers tournament this weekend. In Game 1 they beat Woodstock, 2-1, a goal with 1.7 seconds left in the game. They then beat Sault Ste. Marie, 1-0 in Game 2. -The United Restaurant Atom B Crunch beat the Kingston Ice Wolves on Wednesday and then lost 1-0 to the Ennismore Eagles on Saturday. 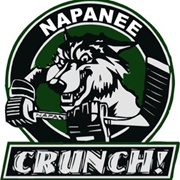 -Napanee’s Novice B Crunch beat the Peterborough Ice Kats on Saturday, 2-1.